Not to be confused with Overbrook Elementary School. 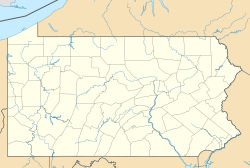 Overbrook High School is a public, four-year secondary school in the Overbrook section of Philadelphia, in the U.S. state of Pennsylvania. 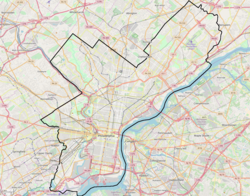 Overbrook High School is designated by the School District of Philadelphia as Location #402, in the West Region. The building was built in 1924 and designed by Irwin T. Catharine. It was added to the National Register of Historic Places in 1986. Overbrook is perhaps best known for its famous alumni, who include Wilt Chamberlain and Will Smith. At least 11 Overbrook alumni have played in the NBA, and the school is ranked sixth in that respect. Tony Costner (born 1962), former professional basketball player who was selected by the Washington Bullets in the 2nd round (34th overall) of the 1984 NBA Draft and later played in Europe and in the Continental Basketball Association. Bobb Goldsteinn, songwriter/producer; coined term "multimedia"
^ a b National Park Service (23 January 2007). "National Register Information System". National Register of Historic Places. National Park Service. ^ "Explore Overbrook High School in Philadelphia, PA". GreatSchools.org. ^ a b Encyclo of World. "Wilt Chamberlain Biography". Encyclo of World Biography -Advameg, Inc. Retrieved 1 October 2011. ^ a b Fontana, Tony. "Will Smith (I) – Biography". IMDb.com, Inc. Retrieved 1 October 2011. ^ a b c Mazique, Brian. "6. Overbrook High School (Philadelphia, PA)". Bleacher Report, Inc. Retrieved 1 October 2011. ^ a b c "Cameo Parkway 1957–1957". AlbumLinerNotes.com. Retrieved 2 October 2011. ^ "Performer, Educator and All That Jazz" (PDF). Retrieved 15 February 2013. ^ Greene, Nick. "Gioun "Guy" Bluford Biography – NASA". About.com – NYTimes Co. Retrieved 1 October 2011. ^ "Solomon Burke:Biography from Answers. com". Answers Corporation. Retrieved 2 October 2011. ^ Silary, Ted. "Best high school hoops players of past 35 years", Philadelphia Daily News, May 4, 2012. Accessed March 17, 2018. ^ Gross, Dan. "Delfonics singer Randy Cain dies at 63". Philadelphia Media Network Inc. Retrieved 2 October 2011. ^ Roberts, Kimberly C. (14 October 2011). "'A Boy and His Soul' defies stereotypes". Retrieved 20 September 2017. ^ Reid, Ron. "Jon Drummond Is a Fixture at the Penn Relays". Philadelphia Media Network Inc. Retrieved 2 October 2011. ^ "Most breast augmentation surgeries performed: Ted Eisenberg sets world record". World Records Academy LLC. Retrieved 2 October 2011. ^ "Brady: Wilt Needs a Stamp". Philadelphia Media Network. Retrieved 1 October 2011. ^ "Mike Gale NBA & ABA Statistics". Sports Reference LLC. Retrieved 2 October 2011. ^ White, Josh. "Did You Know The Fillmore East's Joshua Light Show Really Started Here?". WestView News. Retrieved 16 February 2013. ^ "Mahdi Abdul-Rahman NBA & ABA Statistics". Sports Reference LLC. Retrieved 2 October 2011. ^ "Wayne Hightower NBA & ABA Statistics". Sports Reference, LLC. Retrieved 2 October 2011. ^ "SIXERS: Exclusive interview with Wali Jones - 8/1/2001". NBA Media Ventures, LLC. Retrieved 2 October 2011. ^ Pray, Rusty. "Jacon Landau. 83, artist shown in major museums". Philadelphia Media Network Inc. Retrieved 2 October 2011. ^ "James Lassiter". Imdb.com Inc. Retrieved 16 February 2013. ^ "Hal Lear NBA & ABA Statistics". Sports Reference LLC. Retrieved 2 October 2011. ^ "Jeffrey Leonard Stats". baseball-reference.com. Sports Reference. Retrieved 17 July 2017. ^ Jackson, Roger. "Pope, Pols, Black Magic Lewis Lloyd, No. 2 in rebounds and scoring, is Des Moines' latest rage Roger Jackson". SI Vault.com Time Inc. Retrieved 16 February 2013. ^ Jensen, Mike. "Philly's Andre McCarter recalls John Wooden". Phila. Inquirer. Retrieved 16 February 2013. ^ "Piasecki Aircraft Corporation >> About >> PiAC". Piasecki Aircraft Corporation. Retrieved 2 October 2011. ^ Writer, Daryl Bell Tribune Staff. "From Overbrook High to Baltimore's next mayor". The Philadelphia Tribune. ^ "Johnny Sample". pro-football-reference.com. Sports Reference LLC. Retrieved February 1, 2016. ^ "Paul Wallace". Peach Basket Society. Blogspot. Retrieved March 12, 2017. ^ Kram, Mark. "Williams, Willie L. 1943-". HighBeam Research, Inc. Retrieved 2 October 2011. This page was last edited on 2 April 2019, at 05:00 (UTC).